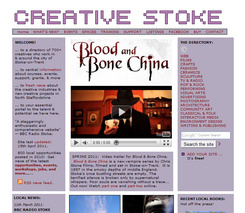 Those in search of Creative Stoke’s News Updates can now find them in a new format at Creative Stoke’s moderated Facebook group, a group that now has over 1,800 members. As a historian I feel it’s sad to depart from the old newsletter format, used for more than ten years, since it provided an accessible historical record of the growth of the city’s creative scene since 2001. Facebook groups are much harder to archive, in that respect. But a Facebook group is just so much easier for your editor to administer.